Inspiring, healing, personalized beauty sessions await with Jackie Shawn CAHP (Certified Aromatherapist Health Professional), renowned makeup artist, hair maestro and well-being guru with 30 years expertise cultivated in the international beauty community. A vessel of in-depth mind, body and soul knowledge with focus on balancing the autonomic nervous system, relieving stress and fortifying the immune system to harness total well-being she is, as well, deeply passionate about all-natural cosmetics & skincare. Reveal to the world your inner and outer beauty. Book a session today! + HAIR BASIC 40 minutes @ $90.00 - Blowout or flat iron on prepped hair. + HAIR COMPLEX 1 hour @ $150.00 - Beachy waves, top knot, classic chignon or messy updo on prepped hair. SPECIAL OFFERING First-time Being Beauty believers receive a $20.00 appreciation bonus toward your second BEING BEAUTY WOMAN session. SPECIAL OFFERING First-time Being Beauty believers receive a $20.00 appreciation bonus toward your second BEING BEAUTY MAN session. 1 hour @ $150.00 - Based on what is happening with your skin right now essential oils are compounded into a handcrafted all-natural cream for face and body. Hormonal and emotional stresses in life are always changing and this is reflected in your skin, the largest organ in your body. Rest assured, as you evolve so will your cream ingredients. Light up your skin with nourishing, enriching comfort. Leave your session with a personalized cream. 1a/ CUSTOM CREAM via SKYPE - 1 hour @ $150.00 - VIRTUAL SESSION via VIDEO. 1 hour @ $180.00 - (1 hour + 7 day alchemical blending process) Access soul-level healing with the plant soul of oil and your soul. Enlighten patterns of soul expression such as personality traits, reaction tendencies like depression, anxiety or chronic fatigue rather than physical symptoms. Integrate a wholeness of being with specific compounded therapeutic essential oils that relate to your present reality. This spiritual phytoessencing oil takes 7 days to process. Wear the scent of your soul. 2a/ CUSTOM OIL via SKYPE - 1 hour @ $180.00 - (1 hour + 7 day alchemical blending process) VIRTUAL SESSION via VIDEO. 2 hours 30 minutes @ $375.00 - Put your face forward by learning how to enhance your makeup style and discover what works best in your makeup case. Share your makeup challenges and also what excites you. Together we map a chart for day and evening looks that compliment your lifestyle. 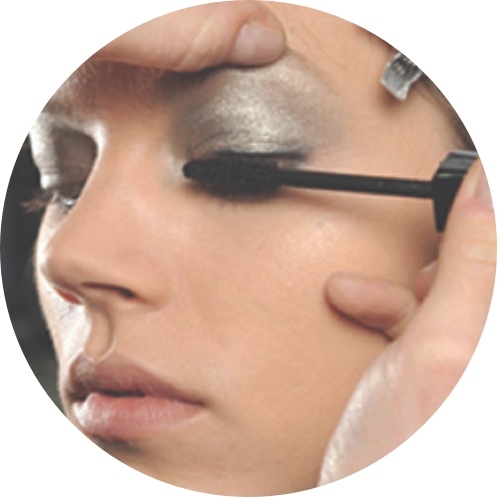 Be guided to master an eyeliner technique ideal for your eye shape, create a sculpted cheek, finesse a smokey eye and discover how to perfect a full lip. Open to new insight on the best cosmetics for your daily routine, their ingredients and depart knowing that your next purchase decision will be an informed one. Finally, let's take a look inside your makeup kit and see how it can evolve most productivly. Shine with the gift of beauty knowledge! 2 hours @ $245.00 - Embrace facial cellular rejuvenation empowered by the ancient art of acupressure and essential oils compounded specifically for you. Release blocked energy (chi) to increase fresh oxygenated blood flow which nourishes cells and the musculature of the face. Your face is what you show the world and it is here that you can see repetitive patterns appearing as fine lines. Receive a consultation to determine factors such as stress, food , lifestyle, and skin issues. Welcome warm compresses infused with a customized blend of oils to allow the face to relax and open to programmed crystal wands to enhance deep cellular communication. Feel the healing power of touch activating twelve major nerve centers on the head and release tension throughout the body. Listen to the vibration of Tibetan singing bowls to shift stagnant energy. Multiple sessions, different for everyone, are likened to a "natural face lift". Benefit from the merging of face, heart and soul. + CUSTOM CREAM BONUS $65.00 - Customised compounded essential oils from your Face First session are blended into a take-away face and body cream. * SPECIAL OFFERING Book 4 Face First sessions and receive a Custom Cream gift. 1 hour @ $175.00 - Using the WBLab EOS (Essential Oil Signature) seasonal blend experience transformative cellular communication via fingertip touch on 12 major head nerve centers. Use as an introduction to facial rejuvenation or maintenance between Face First sessions. 1 hour @ $150.00 - Realign your chakra's and nervous system with this grounding therapy that enables calm and peaceful well-being. Treat yourself to deep presence with the ancient healing touch technique of reiki and break up static energy via the sound vibration frequency of handcrafted Tibetan singing bowls. Entrust programmed crystals to light up, expand and amplify cells. This is an intuitive primal connection that humans have passed from one generation to the next for thousands of years. Radiate your full being. What better way to share the WBLab experience than with a little bit of love! Book a GIFT certificate(s) for that special someone to use toward a session of their choice. GRATITUDE - Receive a $20.00 referral appreciation bonus toward your next booking when a referral completes a session. * Only one bonus granted per session. Experiences for more than one can be found here. Sometimes participating with friends, family or both is what is needed and we love that! Share your inspiration and enquire to collaborate. One + More services are priced pending request. Celebrate community at WBLab with friends, colleagues or family! Let us know what energizes you and we'll make it happen. WBLab can accommodate up to six for a sit/table session and slightly more for a floor session. Send a query so we can discuss details and enable creation to begin! These are a few idea's to stimulate inspiration. Weddings are special moments of laughter, inspiration and love and that is why we enjoy doing them. Whether it be a black tie or casual wedding I always let your beauty shine and will finish before the event or stay for its entirety. Makeup or makeup/hair services available for the bride, groom, attendants, and matriarchs. WBLab, local and international travel possible. "Love, Love, Love! Everything and every moment! I am speechless. You are the absolute best!" — Susan Ready to go to the venue! This was a beautiful early winter black tie wedding and Susan was radiant with gold accent on the eyes and a hint of blush on the cheeks. I also did her mother, five maids, three flower girls and grooming for the men.